Looking for a casual, homey accent for your table settings? 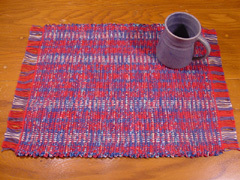 Try our rag placemats and table runners woven with strips of fabric to create that wonderfully textured and colorful "rag look". Extremely durable and machine washable, these table linens will look great for many years. 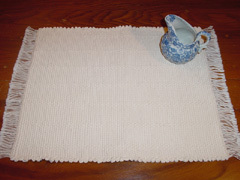 Placemats measure approximately 13" x 16.5" plus 1.25" of fringe on each end. 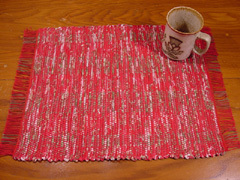 Matching table runners are available in 3', 4', or 6' lengths. Made of cotton and cotton-blend fabric. Subtle striping enhances the Ralph Lauren fabric that is the filler in these 100% cotton placemats. Warm shades of sage, mint, rose, and brown will make dining at your house a memorable event. Also available in matching throw rugs. You will create a wonderfully festive atmosphere when you deck your table with these playful rag placemats and table runners. The chili pepper and olive fabric featuring a sprinkle of white is accented with olive striping. Vibrant dark red, cobalt blue, and a bit of aqua make this group a wonderful choice for backyard picnics or casual meals indoors. The beige and cobalt log cabin striping adds an upbeat tone to this lively mat. 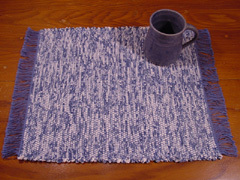 A subtle blend of blues and cream gives this placemat a classic look. Perfect with cream-colored dinnerware or more casual folk pottery. 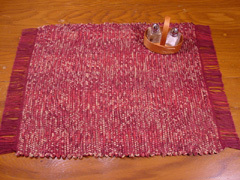 The fabric in this placemat produces an intriguing play of deep rich burgundies, terra cottas, and wood tones. 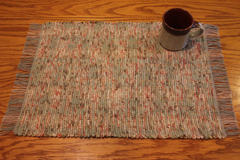 The "log cabin" striping is a subtle reminder that this mat is handwoven and individually crafted. Elegance coupled with simplicity is often the perfect choice for a natural handcrafted touch. Subtle warp spacing provides striping via texture rather than color to give this placemat an understated but sophisticated look.